Proximity Switch VJ8A3-2-Z/CYG, 6~36VDC, PNP, NO+NC, 2mm, М8x60mm, unshielded for socket Inductive sensor with metal housing M8 x 40 mm, type PNP, unshielded, rated tripping distance 2 mm plug with four conductor cable. Proximity Switch VJ8A3-2-Z/CXG, 6-36VDC, NPN, NO+NC, 2mm, M8x60mm, unshielded for socket Inductive sensor with metal housing M8 x 40 mm, type NPN, unshielded, rated tripping distance 2 mm plug with four conductor cable. Proximity Switch ID30N3E1L, 10-30V, NPN, NO+NC, 8mm, M30x75mm, shielded Proximity Switch M30 x 75 mm, ID30N3E1L, NPN, NO+NC, 10 - 30 VDC, range 8mm, shielded. 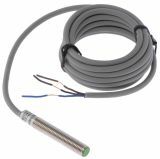 Inductive sensor PEPPERL + FUCHS 07830 S, M11X33MM, 8VDC Inductive sensor with PVDF housing, 11x33 mm, 2-wired cable. Proximity Switch, M18x65mm, ID18U1E1L, NO, 12-30VDC, range 5mm, shielded Inductive Sensor M18 x 65 mm, ID18U1E1L, 12-30 VDC, NO. Proximity Switch M8x50mm VM08N1E1L NPN NO 10-30VDC, range 1mm, shielded Proximity switch VM08N1E1L NPN with voltage 10-30VDC and NO contact. Proximity Switch M8x50mm VM08P2E1L PNP NC 10-30VDC, range 1mm, shielded VM08P2E1L PNP 10-30VDC proximity switch NC contact. Proximity Switch M8x50mm VM08N2E1L NPN NC 10-30VDC, range 1mm, shielded VM08N2E1L NPN 10-30VDC proximity switch NC contact. Proximity Switch M12x65mm VM12N31L NPN NO+NC 10-30VDC, range 3mm, noshielded VM12N31L NPN 10-30VDC proximity switch NO+NC contact. List Price 26.90лв. VAT Incl. 25.55лв. VAT Incl. 24.21лв. VAT Incl. Proximity Switch M18x70mm VM18N3E1L NPN NO+NC 10-30VDC, range 5mm, shielded VM18N3E1L NPN 10-30VDC proximity switch NO+NC contact. Proximity Switch M18x70mm VM18N31L NPN NO+NC 10-30VDC, range 7mm, noshielded VM18N31L NPN 10-30VDC proximity switch NO+NC contact. Proximity Switch VJ12A3-4-Z/CY-G, 6-36VDC, PNP, NO+NC, 4mm, M12x66mm, unshielded for socket Proximity switch VJ12A3-4-Z/CY-G with metal body ф12x66,NO+NC contacts, unshielded, sensing distance 4 mm. List Price 24.90лв. VAT Incl. 23.65лв. VAT Incl. 22.40лв. VAT Incl. 21.16лв. VAT Incl. Proximity Switch LJ12A3-4-Z/CX-G with socket 10-30VDC NPN NO+NC M12x66mm range 4mm Proximity switch LJ12A3-4-Z/CX-G with metal body ф12x66, NO+NC contacts, unshielded, sensing distance 4 mm and LED working status indication. Proximity Switch LJ8A3-2-Z/BX-G with socket 10-30VDC NPN NO M8x60mm range 2mm Proximity switch LJ8A3-2-Z/BX-G with metal body ф8x60, NO contact, unshielded, sensing distance 2 mm. Proximity Switch LJ8A3-2-Z/BY-G with socket 10-30VDC PNP NO M8x60mm range 2mm Proximity switch LJ8A3-2-Z/BY-G with metal body ф8x60, NO contact, unshielded, sensing distance 2 mm. List Price 19.00лв. VAT Incl. 18.04лв. VAT Incl. 17.10лв. VAT Incl. 16.12лв. VAT Incl. List Price 19.00лв. VAT Incl. 18.05лв. VAT Incl. 17.10лв. VAT Incl. 16.15лв. VAT Incl. Inductive sensors are electronic sensors that function on induction principle. The signal at the active end of the edge of the device opens or closes the circuit at the end, if a metal object or a metal surface are detected into the working distance (Sn). The sensor emits an electromagnetic or electrostatic field and detects any changes in it or in the feed back signal without physical contact with the scanned item. Inductive sensors are suitable for application in various spheres of industry and automatic production such as moving elements control and monitoring, tracking the number of products and parts, speed and round detection, level regulation, etc. They are used for remote monitoring of machine's vibrations and surveillance of active elements such as shafts, bearings and bushings.